Having several employees in your repair store can be quite handy for business. However, for an organized record of sales transaction and to know who actually did a sale, it is necessary to have a tool that keeps an active record of invoice creation and allow only authorized employees to add payments to an invoice. We are super excited to roll out a feature which will request employees to enter their Access PIN codes while processing a sales transaction or adding a payment to a due invoice at a later date. Once this trigger is enabled, RepairDesk will ask your employees to enter their Access PIN codes while making changes to an invoice. 1. Just go to Settings. 2. Head to Module Configuration. 3. Click on POS from the options. 4. Enable the trigger "Employee should enter access pin before sale transaction". 5. Click on Save button to activate trigger. Now when someone is processing a sales transaction, RepairDesk will ask employee to enter his or her Access PIN code before heading to Checkout to create an invoice. 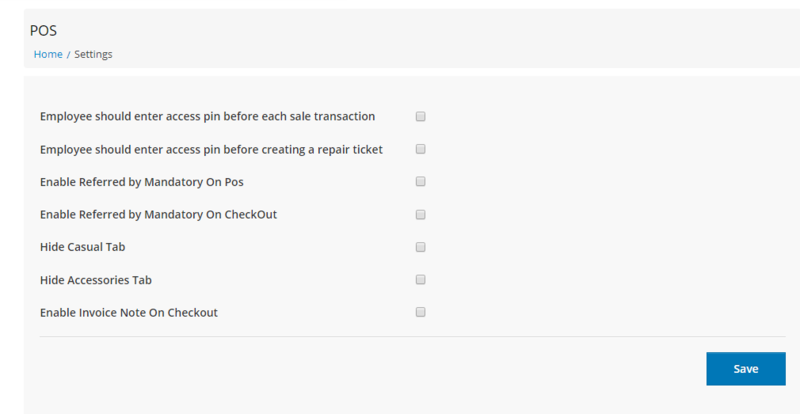 Once this trigger is enabled, RepairDesk will also ask for Access PIN code before adding a payment to an invoice. When an invoice is opened and a payment is about to be added to an invoice, a pop up screen will open, asking for employee to enter Access PIN before adding payment. If an employee doesn't do so, then payment would not be added until he enters it. In transaction log you will also be able to see who made the particular sales transaction. How can I manage invoices in RepairDesk? How do I create an invoice from ticket screen? How can I Add Terms & Conditions on Receipts, Invoices and Signatures? How to update multiple invoices at a time? How can I add/edit customer to an invoice? How do I add a new product on invoice? How do I download an invoice in PDF Format? Can I create a duplicate invoice? Can I change/ edit Invoice number? How can I edit or customize Invoice design? How can I send Invoice via email? How Can I Send Multiple Invoice Reminder to Customers?